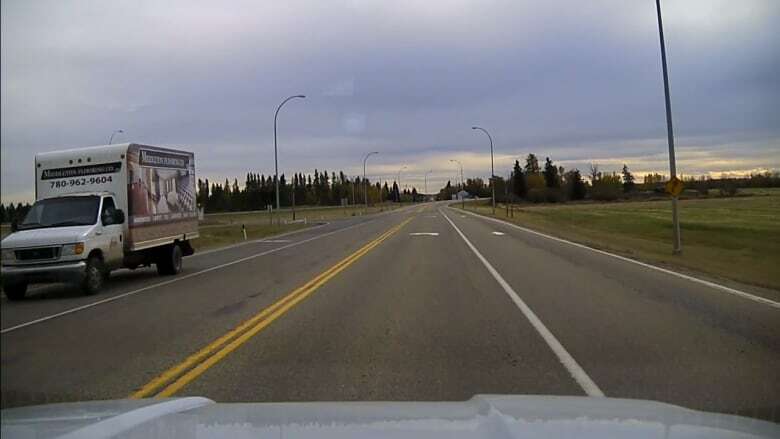 RCMP investigating fatal gas and dash in Thorsby, Alta. A gas station attendant has died after being struck by a vehicle Friday afternoon in a gas-and-dash incident southwest of Edmonton. Officers with the Thorsby-Breton RCMP were called to the scene at 3:45 p.m. near a Fas Gas service station on 52nd Street in Thorsby, Alta. As the vehicle drove away from the gas station, a 54-year-old employee tried to get the driver's attention and was hit by the vehicle. RCMP Sgt. Corey Kyle says the investigation is in its early stages but confirms it appears someone was speeding away from the Fas Gas station without paying for their fuel when the fatality occurred. Police said a stolen, medium-sized white commercial cube van was seen leaving the scene and has not yet been located. The van has "Middleton Flooring Ltd." written on its front and side. The man died at the scene after emergency services tried to administer first aid, RCMP said in a news release Friday. Kyle says a number of investigators are on scene and a crime scene analyst is reconstructing what happened. "This is not a normal thing in rural Alberta. It's even more rare with it to have serious consequences," Sgt. John Spaans told CBC News. Investigators from Edmonton have been called to the scene as the investigation continues. Ironically, it was not the only gas and dash the detachment dealt with on Friday. They said in a news release they had arrested two people in a gas and dash involving a school bus that had earlier been stolen from the Rimbey area. They also said the suspects are believed to have stolen a truck from a man who stopped to assist them on the highway, and to have stabbed another civilian whose car they tried to steal. That driver suffered a cut which was treated on scene.